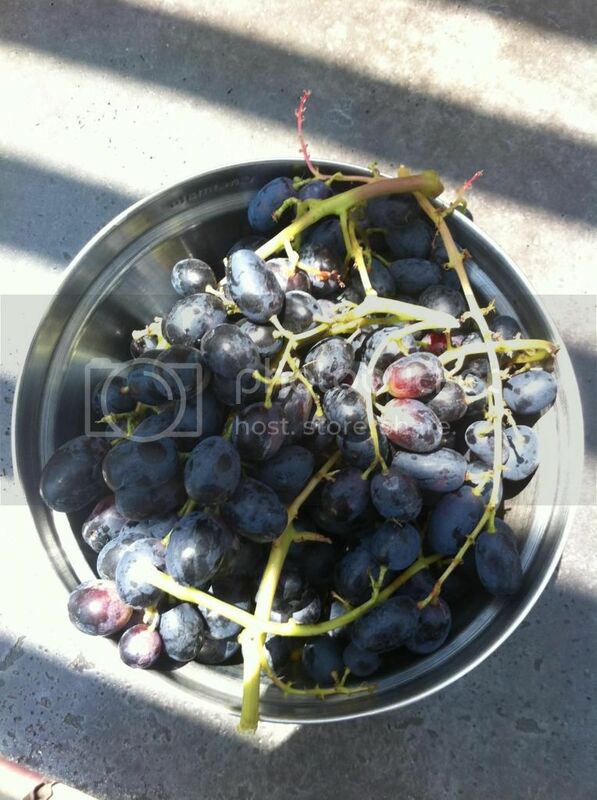 This morning I started harvesting grapes. My crop is huge this year! I did not thin the clusters enough though so some of the bunches are rather small. The bulk of the crop needs about another 3 weeks to ripen but I harvested this bowl this morning. I am fairly certain this is a seedless concord but I received it as a cutting from a friend so I am not entirely sure. How are your crops coming along this year? Greetings, Congratulations on the bumper crop. We were grape growers, for raisins, Mother had 10 brothers with ranches in the Fresno, Yetem, area of California. They produced raisins and of course brandy during prohibition. We haven't made wine for a few years, we, our family, grow vines now for the leaves. Thanks for the picture, it must be the lighting, they don't look like Concord. Have a very good day. Well, I only have one lil grapevine (but hope to have more later) and this is the first year I have had any grapes grow at all. So I have nothing to compare, but am happy with having some bunches to munch on. I really don't know anything about growing grapes, though so am glad anything grew at all. Your grapes look really good! I tried growing grapes a long time ago, about when I first started garden. At that time I didn't know much and didn't know how to properly do things. So, my first and last attempt at growing grapes didn't turn out so good. They were just tiny! So lovely your grapes look ReptileAddiction, sure they taste delicious. I bought a grape vine in June, the very first for me. It is growing well, no signs of fruit yet of course, too early for that. But I would be thrilled to bits to even get a few grapes. Let you vine know how much you like it, water it, don't over feed. and you're sure to have grapes. One of our vines has gray water form the house running past and is pleased with that. On the hight desert the vines, our vines, are watered daily. 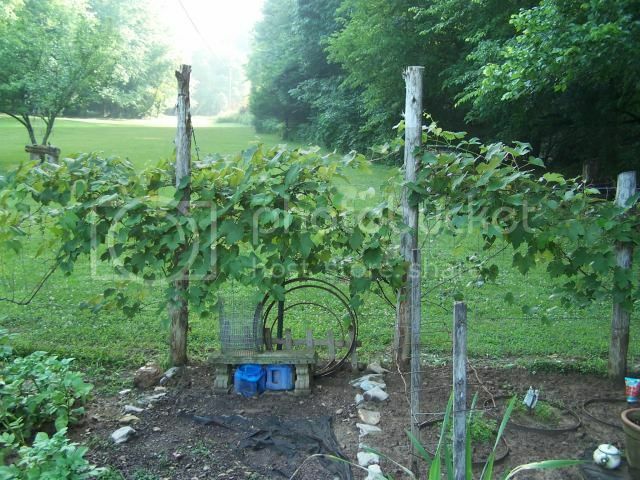 If your vines are in an area where the leaves stay damp, clear room for air movement so they'll stay healthy. There are, here with us, people who do well with vines, the better the conditions they're grown in the healthier and happier they'll be. Have a great day. Just moved into a house with grapevines going down about 10'. There are lots of grape bunches but only a couple turning purple. No idea what they are. Thanks for the compliments! They sure do taste much better than any other grapes from the store or even the farmers market. I literally do nothing to this vine except heavily prune it in the winter. No fertilizer and only water from the rest of the yard. It grew over 18 feet last summer. I am going to have to start thinning the clusters to get bigger fruit though. I definitely noticed a large decrease in fruit size towards the end of the crop. Awesome grapes. Any food that you grew yourself is a win in my book. How long have you been on this grape growing journey? This spring I planted a half dozen grapes along a trellis I built last year hoping for kiwi's. The kiwi's died and I figured I liked grapes better anyway. Of the few I planted I had one that had grown several feet and it was the superstar in the group. 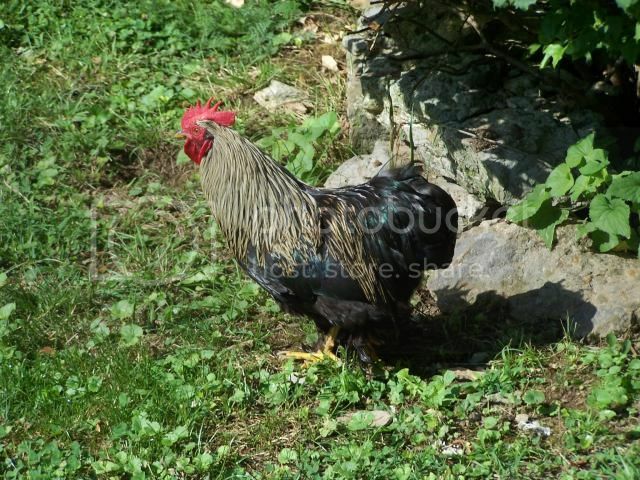 Then I had to knock down some weeds next to it and the weed trimmer got away from me and I chopped down my baby. I hope you have much better luck than I did going forward! A friend dug up his vines having no luck because of disease what I discovered was a problem called Black Rot. A fruit that early on looks very nice begins to develop spots that eventually lead to the drying up of the berry and kills the harvest. The local ag center identified the problem for me and directed me to use an application of Captan a water soluable powder sprayed on at first sign of buds. The application must be applied every 10 days up to harvest. I lost about half the fruit before discovering the solution and learned enough to get ahead of the problem so come spring Ill be ready. The problem is that the spot is a fungus that winters in the root so it is always present as the new growth begins to develop the spores are transmitted to the leaves and then to the fruit by the wind and birds etc. When the infected berry dies it falls to the ground called a mummy and the disease continues to regenerate itself. The Cantan forms a chemical shell about the new growth and the spores cannot infect the plant and protects the fruit. A lot of attention is required to keep the vine healthy. I know of no way except to pull the vines and not replant in the same location. The "Mummies" will infect a newly planted vine. I will see how this season goes and then decide what to do. I will talk so some of the local wineries and see what they tell me. I would ;ike to hear from anyone has battled this disease and how you managed it. Early on the fruit really looked promising. The spots first started to appear on the leaves and as the berry clusters began to appear it quickly took control. These vines are 3 years old. There are 3 different vines all I know is they were reds, whites and blues. 4 vines total. 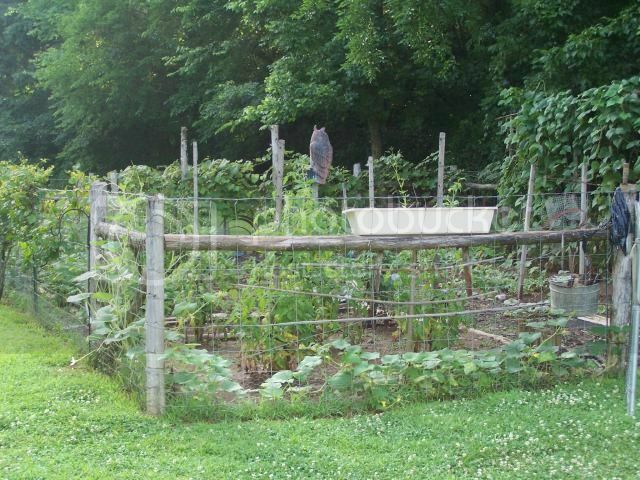 In general the garden did pretty good this season but it did tell me it needs a little boost this winter so Im going to get some 30-30-30 tilled in in the next week or so as soon as the ground dries a little. Middle Tn has had a real cold snap as most of the country did but its a little more normal this week. Hope everyone made it through that miserable cold spell alright, hey spring is a day closer and before long its time to plant. Your place lookes wonderful, and the fellow in charge of the bug patrol is handsome. Mother had ten brother, they had ranches in the Central Valley of California. Grape, raisin,,and brandy was their crop. I learned a lot, not all, from them, there is always more to learn. Glad you found and are dealing with you vine problem. I may have heard of Captan, but would not have remembered to mention it's use. Thanks for showing the great pictures. 5th year grape vine...no grapes! 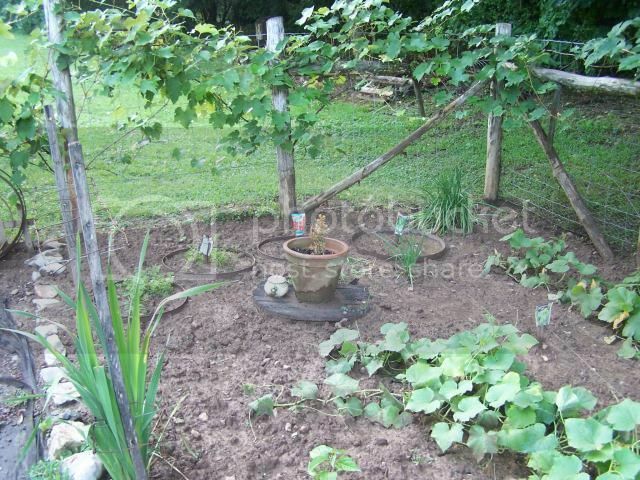 How to Trim Grape Vines?